BROKEN ARROW, Okla. – RISE Armament is pleased to introduce the RA-535 Advanced-Performance Trigger (APT) for modern sporting rifles. The single-stage drop-in trigger group has an ultra-crisp release with almost nonexistent over-travel and a quick reset for a faster response time between shots. The RA-535 APT has a 3.5-pound pull weight, and it combines straight trigger functionality and comfort with curved control. The RA-535 APT retails for $259. Its self-contained design makes it easy to install, and it comes standard with KNS pins. “Gun owners have the option to upgrade their standard AR-15 trigger to one that’s much more responsive. We believe our trigger group can benefit everyone from competition shooters to hunters,” Barger adds. The RA-535 APT is precision CNC machined from high-grade, heat treated tool steel and aluminum. Each trigger group is contained in RISE Armament’s signature bright red 8625 hardcoat anodized aluminum housing. RISE Armament manufactures TIER 1 firearms and components at its Oklahoma facilities. Its innovative products include precision rifles, barrels, trigger groups, and additional rifle accessories. All RISE products are manufactured according to stringent AS9100 aerospace requirements. 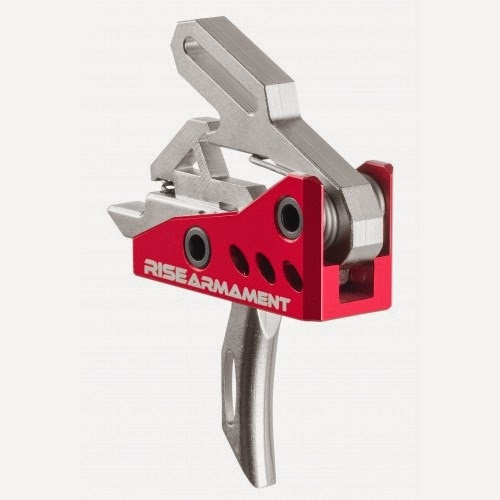 For more information about RISE Armament, visitwww.risearmament.com.